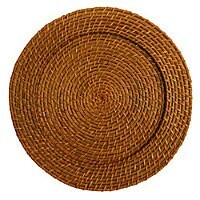 Home > Products > ChargeIt by Jay Round Honey Rattan Charger Plate 13"
This item will be back in stock June 20th. Order now to reserve. Use the ChargeIt by Jay Round Honey Rattan Charger Plate 13" to give your table setting a natural, eco-friendly makeover. Perfect for use in outdoor cafes and themed receptions, this product boasts earthy brown hues for a tropical charm. Thanks to its intricate thick weave, this charger provides an excellent backdrop for a variety of dinnerware. Made from high quality rattan, it is exceptionally tough and durable for years of reliable use. To keep this charger plate in excellent condition, simply wipe clean with a damp cloth.